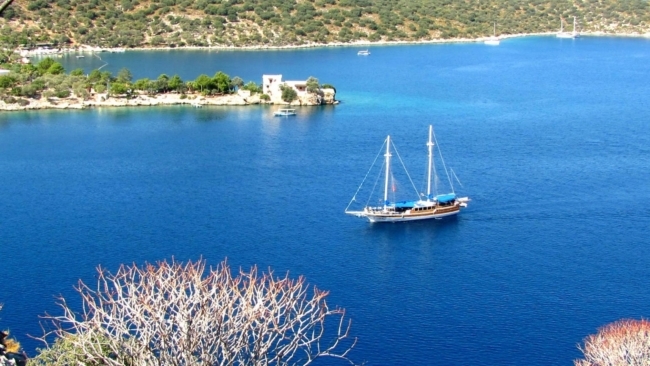 “A2B Yachting” provides blue cruise from Olympos to Fethiye. 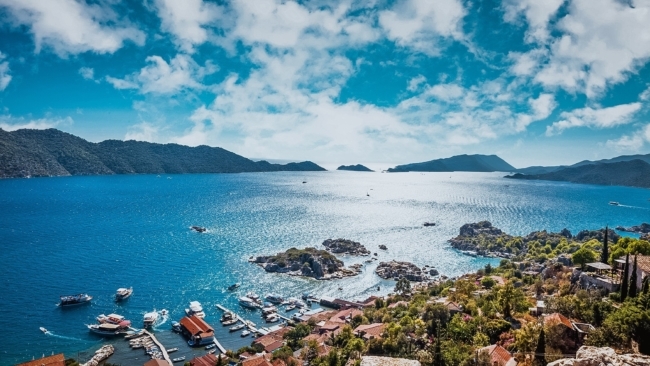 Explore this beautiful Turkish Riviera and mysterious Lycian coast on a Turkish Gulet. 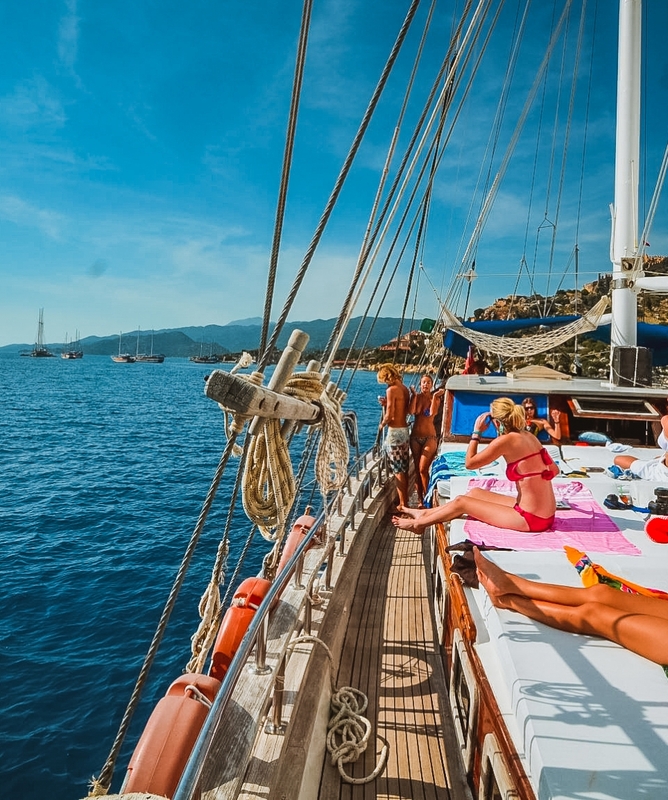 Have a unique experience and enjoy the sailing trip in Turkey with a group of sea-lovers from all around the world. 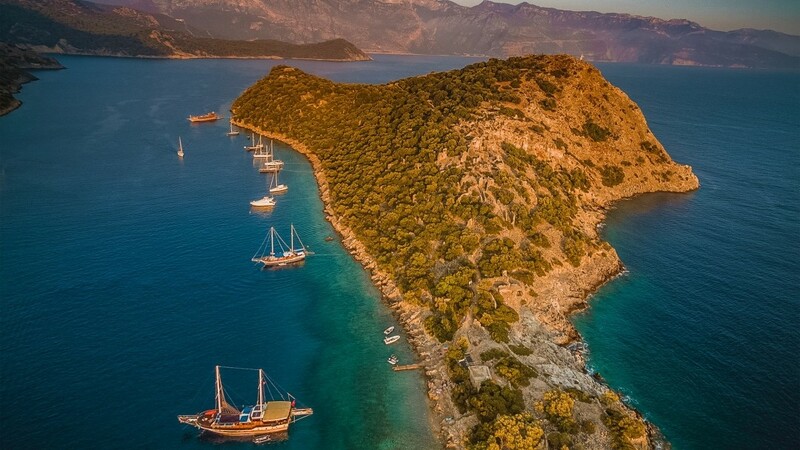 The Olympos to Fethiye cabin charter is one of the most popular routes along the . This blue cruise gives you the opportunity to combine land and sea excursions. Not only you can enjoy swimming in the “Blue Flagged” waters with beautiful natural bay, but also you will get a chance to explore the beautiful islands and lovely fishing towns with great historical sights. 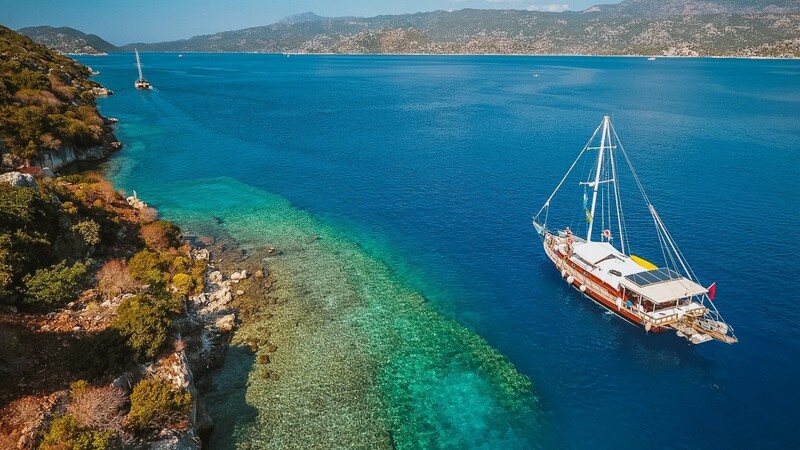 This blue cruise takes 4 days and 3 nights in traditional wooden Turkish gulet, starting by bus transfer from Olympos to Demre, embark your gulet in Demre and cruise down to Fethiye. You will have You Enjoy swimming, snorkeling and sun bathing! Pick-ups from Olympos by bus between 10:00-11:00 am and transfer to Demre (Andriake) Harbour. Departure from the harbour around 13:00 and set sail to beautiful Kekova area, cruise along the Sunken City of Kekova, the protected Lycian-Roman archaeological site and witness its stunning beauty of its sunken city submerged under water. Stop over at Simena (Kalekoy), a traditional Turkish fishing village with no car access. Visit Byzantine/Ottoman castle on the top of the village where you can see magnificent panoramic view of Kekova area. Spend your evening in Gokkaya Bay (optional water sports are available) Dinner and relax in this pirates haven or party the night away at the Smugglers Inn. Around sunrise departure to Firnaz Bay near Kalkan for breakfast and swimming. 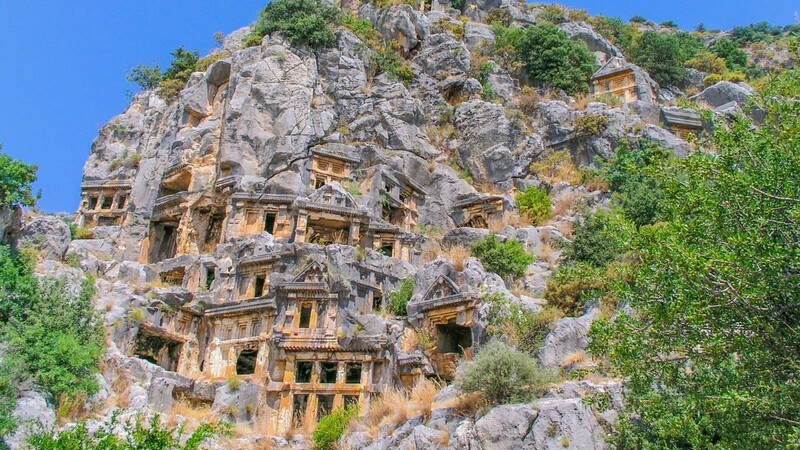 Kas was once known as ancient Antiphellos, you will have plenty of time to explore the village where Lycian rock tombs and sarcophagi and the Roman theatre are still left to be seen. Enjoy shopping or hanging out in lovely coffee shops. After Kas, we move to the bay near Kekova and stop for swimming, dinner & the 2nd night. Around sunrise we depart for Butterfly Valley where we stop (sea conditions permitting) for breakfast and swimming.This natural reserve hosts 136 kinds of different butterflies and moths. 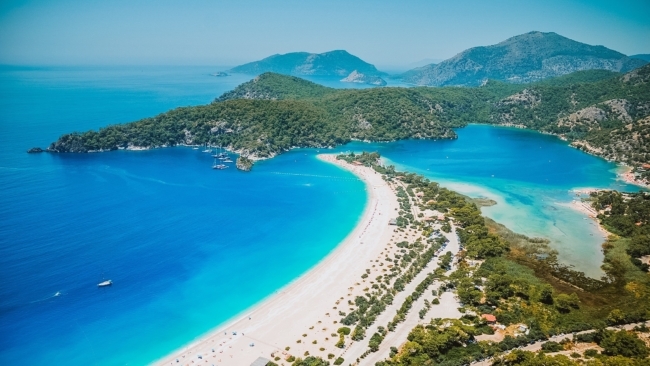 Our next stop is Oludeniz (The Blue Lagoon), a long spit of sandy beach and Baba Dağ (Mt Baba) casting its shadow across the sea. Option for paragliding available. Lunch will be served in a bay near Oludeniz. Last stop of the day is St-Nicholas Island. Explore the island where Byzantine ruins scattered over the area. Enjoy the magic hour of sunset, dinner and last night here. Departure for Samanlik Bay after breakfast, where you can swim in turquoise waters. Enjoy your lunch on board and finally sail to Fethiye Harbour where we expect to arrive between 13:00-15:00. Antalya is the closest bus station to Olympos. There are direct connections from major cities in Turkey to Antalya. From Antalya bus station, you can either choose Antalya Tur or Bati Antalya company that run public buses which operating every half hour and it takes approximately 1.5 hours to Olympos main road bus station (Cirali Olympos Junction). From there, you will have to change to another minibus service to get to Olympos. The nearest airport served by international airlines is Antalya Airport which is about 1.5 hours to Olympos. The easiest way is to book a private transfer in advance or get a taxi from the airport to Olympos. Otherwise, you will have to get HAVAS Bus from the airport to Antalya Bus station and catch another public bus to Olympos juction then another minibus to Olympos village. Olympos is about 50-60 km south of Antalya. Nearest major towns are Kumluca to the south and Kemer to the north of Olympos. The easiest way is to rent a car at the Antalya International Airport. From the airport, follow signs to Kemer. There are two entrances to these villages located on the main highway between Antalya - Fethiye.